Meet the people committed to helping you protect your assets and build a better future. Our vision is to help our people make the right decisions, big and small, to lead the life they desire. We do this by humanising insurance, inspiring people to protect themselves and their loved ones today and helping them plan for a financially secure tomorrow. Chi Kong leads the growth of Etiqa Singapore with a vision to humanise insurance. He has over 35 years of industry experience in Singapore and Malaysia. 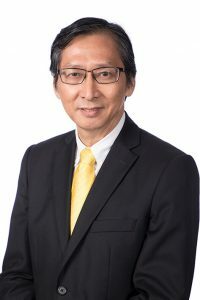 Chi Kong first joined Etiqa Group in 2003 and headed several business units within the Group before his appointment as the CEO of Etiqa Singapore in 2014. He is a Fellow of the Society of Actuaries in USA and holds a Bachelor of Science in Mathematics (First Class Honors) from the University of Malaya. Simon has a wealth of experience in establishing successful bancassurance distribution businesses in the international arena, particularly across Asia and Europe. He now leads the bancassurance distribution and business development of insurance solutions in Etiqa Singapore, including the high-net-worth businesses through the partnerships with leading banks and financial advisers. Prior to his appointment, Simon was the Regional Director of Bancassurance Distribution for Ageas, Etiqa’s joint venture partner. Wai Keong looks after the agency and broking channel growth for the General Insurance business of Etiqa Singapore. With more than 20 years of industry experience, he has been with Etiqa Singapore since 2010. Prior to joining Etiqa, Wai Keong was in GIA handling the general insurance industry’s technical issues and a broker firm overseeing its in-house insurance needs. He is also a Senior Associate and Certified Insurance Professional with the Australian and New Zealand Institute of Insurance and Finance. With more than 20 years of experience under his belt, particularly in the areas of information technology and insurance, Dennis leads the information technology and business transformation initiatives of Etiqa Singapore. His responsibilities also include spearheading and growing the online business to mould Etiqa into the leading online insurer. Prior to his appointment, Dennis has held several management roles with key insurers within the region. He earned his MBA from East China Normal University and holds a Bachelor degree of Architectural Engineering from Chongqing University. Shirley oversees the product development in Etiqa Singapore and directs all aspects of insurance operations to ensure excellence in customer experience, including claims and customer care. She brings with her more than 20 years of experience in life and health insurance. Shirley holds a Bachelor of Arts in Psychology and Statistics from the National University of Singapore. Kevin looks after the valuation and pricing aspects of the life insurance business in Etiqa Singapore. He has more than 15 years of experience in both life and general insurance. Kevin is a Fellow of the Society of Actuaries of U.S.A and a Fellow of the Singapore Actuarial Society. He is also a Chartered Enterprise Risk Analyst and holds a Master degree from the National University of Singapore. Jio Young is responsible for the product pricing of the general insurance business of Etiqa Group, including Etiqa Singapore. He has close to 20 years of experience in reserving, pricing, modelling and portfolio management in both general and life insurance. Jio Young is a Fellow of the Casualty Actuarial Society and a Fellow of the Society of Actuaries. He also holds a Bachelor degree of Business from the Nanyang Technological University. James was appointed as the Head of Compliance in Etiqa Singapore since 2013 with an oversight on the legal function in Etiqa. James has close to 20 years of experience in managing compliance and regulatory matters in the industry, as well as with statutory boards. He is also a certified Associate Financial Planner and holds a Banking and Finance degree from the University of London. With over 25 years of actuarial experience in life, health and general insurance, Mei Eng now oversees the formulation and implementation of risk management policies of Etiqa Singapore. She is a Fellow of Institute of Actuaries and a Fellow of Singapore Actuarial Society. Mei Eng also holds a Master of Science in Financial Engineering from the National University of Singapore. Collin is responsible for the overall development and implementation of human capital strategies across the organisation to support business growth. He is one of the pioneers of Etiqa Singapore and prior to that, he served as the Head of Talent Acquisition for Etiqa Insurance & Takaful, Malaysia. Collin holds a Bachelor degree from the Coventry University of UK. The Board of Directors has the overall responsibility for maintaining the long-term success of the company. This includes ensuring a strong executive leadership, relevance and effectiveness in the governance and achieving the highest standards of business integrity, ethics and professionalism. Dato’ Mohd Salleh Hj Harun chairs the Board of Etiqa Singapore. He joined Malayan Banking Berhad in 1974 and had served in several senior capacities, culminating as the Executive Director of Malayan Banking Berhad from 1994 to 2000. Following which, he was appointed the Deputy Governor of Bank Negara Malaysia, a post he held up to 2004. From 2009 to 2015, he was appointed the Director and Vice Chairman of Malayan Banking Berhad. Dato’ Salleh had held directorships in the RHB Group, including Chairman of RHB Insurance Berhad. He is currently a Director of ACR ReTakaful Berhad, ACR ReTakaful MEA B.S.C (c), Scicom (MSC) Berhad and Asia Capital Reinsurance Malaysia Sdn Bhd. Dr. John Lee is currently the Country CEO and CEO of Maybank Singapore. He was previously the Group Chief Risk Officer of Maybank Group. Prior to joining Maybank, he was a Partner in KPMG, where he was KPMG Global Lead for Islamic Finance, Asia Pacific region Head for Financial Risk Management and Malaysia Head for Financial Services. In 2013, Dr. Lee was awarded the Bank Risk Manager of the Year by Asia Risk and in 2014, he received the award of Risk Manager of the Year by Asian Banker for his contributions to Maybank Group and the financial industry. Mr Kamaludin is currently the Chief Executive Officer of Maybank Ageas Holdings Bhd, the holding company of Etiqa Singapore. He joined Maybank Group in 2012 as the Chief Executive Officer of Etiqa Insurance Berhad. In 2013, Mr Kamaludin was appointed as the Head of Insurance and Takaful of Maybank Group. He is also a Director of AsianLife & General Assurance Corporation., Etiqa General Takaful Berhad and Etiqa Life Insurance Berhad. Mr Van Kempen was appointed the Chief Commercial Officer of Ageas Asia since 2013. Prior to this, he was the Director of Products & Operations at Ageas Asia. He brings with him over 20 years of experience in the international life insurance industry, including his appointments at Prudential Asia Corporation and ING Asia Pacific. Mr Kempen is currently a Director of Etiqa Life Insurance Berhad, Etiqa General Insurance Berhad, Muang Thai Insurance Public Company Limited, Ageas Asia Services Limited and East West Ageas Life Insurance Corporation. He chairs the Investment Committee and is a member of the Risk Management committee of Etiqa Singapore. Mr Kempen is also a Fellow of the Dutch Actuarial Association and Actuarial Society of Hong Kong. Hj Sallim chairs the Audit Committee and is a member of the Risk Management Committee in Etiqa Singapore. He is currently a Director of Mendaki, Self Help Group Student Care Pte Ltd, Wareez Investments Pte Ltd and Chairman of Wareez Halal Pte Ltd. Hj Sallim is also a Council member of Islamic Council of Singapore, Audit Committee Chairman of Mendaki Group of Companies and Islamic Council of Singapore. He is also a member of the Human Resource Panel of The National Council of Social Services and serves as a Member of Disciplinary Proceedings for the Public Service personnel. In addition, Hj Sallim is a member of thee of Institutional Disciplinary Advisory Committee, Long Imprisonment Review Board, President’s Pleasure Review Board and Board of Visitors for Singapore Armed Forces Detention Centre. He chaired the Suara Musyawarah Committee, Malay Muslim SG50 Committee and was awarded the Public Service Medal in 2011 and appointed as Justice of the Peace in 2013. Mr Pakshong is a qualified actuary with extensive life insurance and reinsurance experience. He is currently a Director of Etiqa Life Insurance Berhad. Mr Pakshong chairs the Risk Management Committee and is a member of the Audit Committee of Etiqa Singapore. He was previously the Chief Executive Officer of Tokio Marine Asia Life in Singapore. Mr Pakshong has served on the Council of the Singapore Actuarial Society and is currently a member of the MAS Appeal Advisory Panel. In 2009, he received the award of Distinguished Financial Industry Certified Professional from the Institute of Banking and Finance of Singapore.